The titular James Shelley (Hywel Bennett) is, when we meet him, a highly qualified graduate living an easy life scrounging on the dole, while his girlfriend Fran (Belinda Sinclair) writes her novel. They find a new home in a bedsit run by nosy and abrasive landlady Mrs Hawkins (Josephine Tewson), with whom nonetheless they come to develop a friendship. Shelley’s life gets complicated, however, when Fran falls pregnant and he briefly succeeds, to his chagrin, in finding gainful employment. Shelley ran initially for six series on ITV from 1979 to 1984, the first three written by creator Peter Tilbury, and returned for a further four series from 1988 to 1992. The series rests on the back-and-forth sarcasm of the title character, who is able to talk himself into or out of more or less anything and can outwit most of the characters in the show. 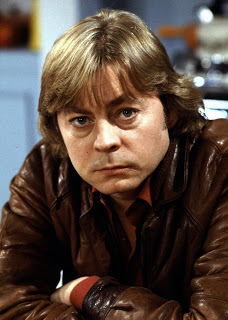 In particular, Hywel Bennett’s performance is superb, and gives Shelley a layer of charm and likeability that the character might not possess on the page. Josephine Tewson’s performance as Mrs H provides him with a perfect foil. Also worth a mention is the memorable theme tune by Ron Grainer, which is surprisingly fast for such a melancholy tune and sets a perfect tone for the show. Shelley was a big hit for ITV at the time, but is now probably fondly remembered by those who remember it fondly, if you see what I mean, and nobody else. Perhaps this is because it was resolutely contemporary, so the changing fashions and topical jokes preclude repeat showings (unlike period settings or prison uniforms, say, which to some extent leave Dad’s Army and Porridge, for instance, less obviously datestamped). That said, time has been a bit unkind to Shelley. Its pacing is very slow – and some episodes are, it must be said, wafer-thin in terms of actual story even compared to the likes of Early Doors – and it’s often well off the three-laughs-a-minute standard that sitcoms have to keep to as a minimum now; overall, it arguably struggles to hold its head up among more recent shows. Another oddity is that although the first four series (which I’ll admit is all I’ve seen, as I’m working my way through the DVDs) take place over an on-screen period of less than a year, covering Fran’s pregnancy and the birth of the baby, they were produced from 1979 to 1982, during which the nature of unemployment changed: attitudes towards scroungers like Shelley got tougher, and unemployment soared. When the show started, part of the joke was that Shelley could easily find a job if he wanted to; a few series in, the joke rests on the immense difficulty of doing so, and the satire on unemployment becomes altogether more vicious as Shelley and Fran slide into poverty and negative equity. Arguably therefore Shelley doesn’t deliver on its premise of charming and determined layabout beyond its first few episodes, as the title character first finds a job and then becomes in earnest need of one. I must say I also struggle to warm to Belinda Sinclair as Fran, who delivers a perfectly good straight performance but somehow lacks the comic chops of Bennett and Tewson. That said, there’s still something enormously watchable about the show, particularly the first few bedsit-set series: it establishes a fairly cosy and likeable world that rewards a weekly visit. The first six series are available on DVD from Network , with the remaining four supposedly due for release but showing no signs of turning up just yet. John Kell Vs Satan, Summer 2017 – the Box Set! BBC sitcom season – could it have done more?